May 2019: Monday 20 May, 2.30pm. The only way to truly understand the magic of what is the No. 1 Manchester Attraction on Trip Advisor is on our regular tour. This is more than a tour of one of the world’s greatest libraries. This is a trip through the industrial and religious history of Manchester linked with the 19th century’s most successful cotton merchant whose legacy survives in the magnificent library named after him. 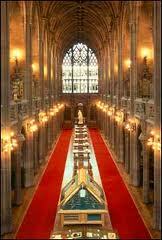 * An outline of John Rylands Library’s Gothic architecture. * The story of John and Enriqueta Rylands. * How the Rylands company became the most successful Manchester cotton merchants of the 19th century. * An outline of the library’s riches. * Remarkable pictures of the library’s and the John Rylands firm’s history. 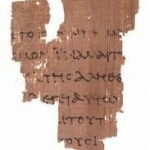 * A look at the oldest piece of the New Testament ever found. * A close inspection of the exquisite Reading Room. * An explanation of the key statues, particularly Francis Bacon, who paved the way for the Industrial Revolution during which Manchester thrived, and John Wycliffe and William Tyndale who led a revolution in religion. The John Rylands Library is often described as “the Taj Mahal of the North-West”, for it is a palace built out of love; a widow’s love for her late husband, a family’s love of religious literature; a city’s love of Gothic architecture. The building looks like a mini-cathedral, a religious icon, a divine presence on Deansgate, but it is one of the world’s greatest libraries, for out of the bequest of John Rylands, Manchester’s richest 19th century cotton magnate, his widow Enriqueta created an unrivalled collection: Dickens’s novels in their original wrappers; a first edition of Shakespeare’s Sonnets; the second largest collection of works by the pioneering printer William Caxton; the personal papers of John Wesley, John Dalton and Elizabeth Gaskell; later complemented, most remarkably of all, by the 2nd Century St John Fragment – the oldest existing remnant of the New Testament. The library was built during the 1890s and deliberately placed on Deansgate next to what was then a violent slum (but is now entirely commercialised) to show Manchester’s underclass that there was an alternative. For them and for all users it was and remains free, a haven of man’s pursuit of intellectual brilliance in a harsh industrial climate. The architect was Basil Champneys whose ecclesiastical touches were toned down by Enriqueta Rylands, a non-conformist. Nevertheless it remains powerfully Gothic – the last Gothic revival building erected in Manchester, which opened on 1 Jan 1900 and was the first Manchester building to be lit by electricity. It was recently restored at great cost with a new grand entrance constructed on the south side. Highlights of the tour include the St John Fragment and the reading room, a grand galleried Gothic extravaganza filled with stained glass and statuary. The St John Fragment is just that – a fragment – found in Egypt at Oxyrhynchus (Behnesa), the ruined city where some of the most startling and successful excavations in the history of archaeology were carried out. 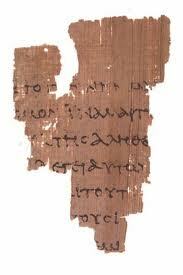 It was donated to the library in 1920 but not identified until 1935 when the papyrus collections were catalogued. The Reading Room is awe-inspiring and overpowering, but the statues come alive when their significance is explained, for here are representations of some of the most formidable figures in British history – Newton, Dalton, Bacon – the links between religion and science, unfashionable at the moment, crucial to the development of civilisation. This is primarily a religious building, a building devoted to religion rather than for worshipping God. Pride of place goes to those figures found here who made Britain the centre of Christian tolerance: John Wycliffe, William Tyndale and John Rainolds. Tours of the library start with an introduction to the city’s cotton past and John Rylands’ religious background outside St Ann’s Church.